Several road marathons and half marathons done, I started to look for a new challenge to push myself that bit further. Reading of endless magazines, from Runner’s World to 220 Triathlon, it was becoming a toss of the coin to delve into the world of triathlon or ultra marathon. With the thought of squeezing into a skin tight tri suit I decided to head the ultra way and find a local race to see what it was all about. Not looking to jump from 42 km to 100 km immediately I went for a 50 km option, yes only 8 km more than a marathon, however this was also going to be on trail. Trawling through various lists of ultras around the South East of England I came across Xtreme NRG who stage ultra and multi-day endurance races. 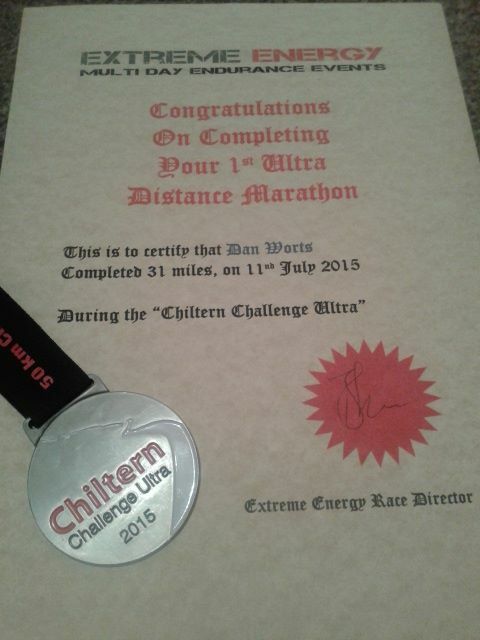 And this was where I found my race, the Chiltern Challenge Ultra. Race day in July, I duly booked and looked forward to three months prep or so. The weeks rolled on by, I was training, road running the usual routes however not overly extending my mileage or strength training. I was, for some reason, not realising what I had signed up for, maybe because it was only 8 km more than a marathon and I had already done a couple of marathons already in the Spring. The word blasé springs to mind. The Chiltern Hills, in Buckinghamshire, is a beautiful piece of English countryside. Rolling hills, villages, quintessential postcard scenery. About an hour or so drive from home, I set off on the Saturday morning with plenty of time and still feeling quite relaxed about the whole thing. A new pair of Nike trail shoes and Ro’s hydration pack for fluid during the race packed up I was all prepared. A small event in comparison to the big international road marathons I do, there were a few hundred runners, from beginners/intermediates through to elites. Elites were classed as being able to complete the 50 km under six hours. On registering for the race earlier in the year for some reason I put myself down to finish within 6 hours so I too was classed as one of the elites eek! Start and finish line was a school hall in Market Risborough. Inside was somewhere to put your bags, loos, drinks and food/snacks (at the finish). A briefing just inside the school car park from the organisers and we were off. My pack full of water, gels packed but no music I was off on my maiden ultra trail. Within the first five minutes we were hit with a fairly steep hill which resulted in many runners having to walk up it including myself. This was a shock to me and made me realise this may be harder than I had first thought. With water, food, medical stations every 10 km it did have a completely different feel to a road race; a lot more personable, friendly and less pressure. I soon realised there was no need to keep track of time, it was all about the experience, taking in the surroundings and meeting runners from the trail world. On the first water stop, I have to admit I was gasping for a drink as I was borrowing Ro’s hydration pack which I did not know how to use, thus leaving me very thirsty at the 10 km mark and having to rather embarrassingly ask someone how to use it. With small arrows stuck on trees, gates and lamp posts pointing the way through various fields, paths, villages it was a case of keeping another runner in sight for reference. There was the odd occasion where the arrows were removed thus confusing runners. I was lost for about an hour with a few other runners, stuck talking to a local asking which way to go. We did have a map however, as we did not know the area, it was not much use. A call to base camp for assistance soon got us on our way however momentum had gone and we still had 30 odd kilometres left. The endless fields and paths continued, the sun was warm and the new trail shoes I was wearing were not the most comfortable. I could have easily run in my road trainers! Picking up the various treats, drinks, fruit at each 10 km was great but at the same time got me into the habit of stop-start stop-start and when you’re tired, stopping for a drink, banana and chat soon made the resuming of running much harder. The last 10 km were particularly hard. In a group of four or five runners and some walkers, the pace slowed completely down and it felt like I was on a rambling day out for a few kilometres. With the last aid station done and great support from the volunteers it was on for the last push and thoughts of finishing at last. Several hours in, no thanks to getting lost, I was out of the last fied and onto tarmac of the local roads surrounding the school and finish line. Coming into the car park the finish line and small sign were visible. Other runners who had finished, who had started earlier, as there were two start times, cheered and clapped me through to the finish line. With the organisers waiting with the medal and congratulations, the photographer caught me crossing the line, with arms just about raised. I had done it, my first ultra and boy was it tough. That extra 8 km took the experience to a whole new level, and more so with the terrain. Running on trail, crossing fields over stiles, tripping over tree stumps, countless water stations, all add up to a different world away from road running and something I will never underestimate should I do another ultra trail. Walking into the school hall, it was straight to the fizzy drinks for a sugar hit, some chocolate, a sit down and talk through of our experience with the other friendly runners. Once recuperated, it was up and a gingerly walk to the car for drive home and bath. 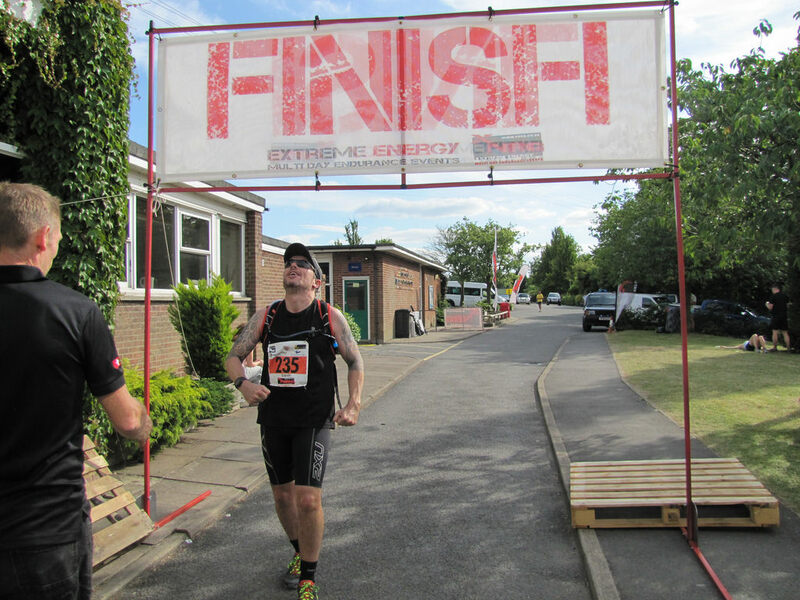 A great experience, set in beautiful surroundings of the Chiltern Hills with a lovely, friendly bunch of fellow runners. I will return to master it and next time take my training to the level needed and give the trail the respect it deserves.